Four-color process printed on Side 1 of uncoated 150lb White Tag stock. 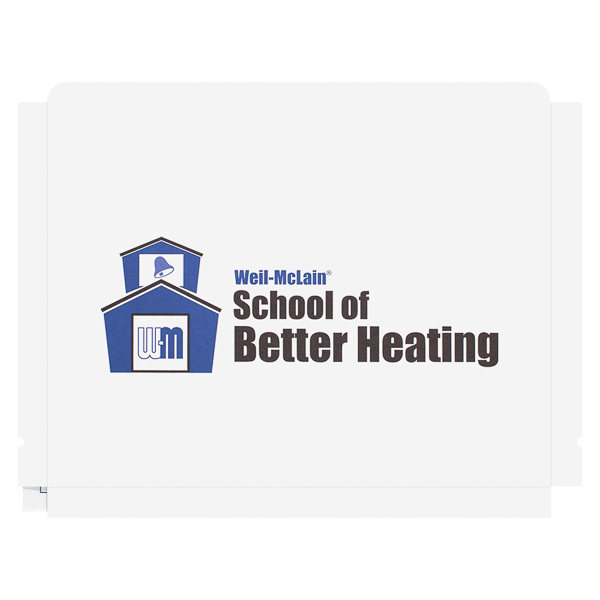 Weil-McLain promotes its School of Better Heating with this simple design. The company's WM logo appears in the double doorway of a vintage one-room schoolhouse, complete with a bell tower. The company name appears in the same blue as the icon to reinforce its brand identity, while the school's official title in bold, black letters catches viewers' eyes. Photos on the back showcase Weil-McLain's boilers, water heaters, and accessories. Side 1 printed with 1 PMS color using light coverage and 1 foil stamped area. 150lb White Tag stock uncoated. 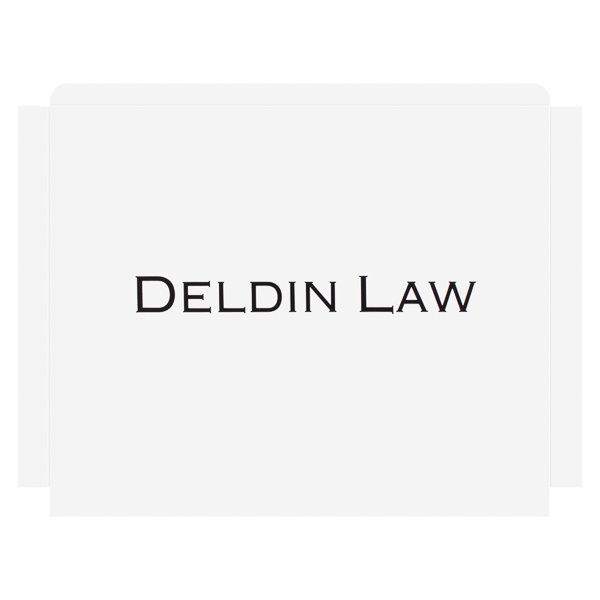 White panels symbolize precision and innocence, perfect for Deldin Law. The firm's name is the sole visual element. Its sophisticated font features wide letters and sharp serifs for traditional text with a modern twist. The black foil logo adds a satiny sheen to the smooth white stock. Side 1 printed with 1 PMS color using light coverage. 80lb Gray Fiber stock uncoated. 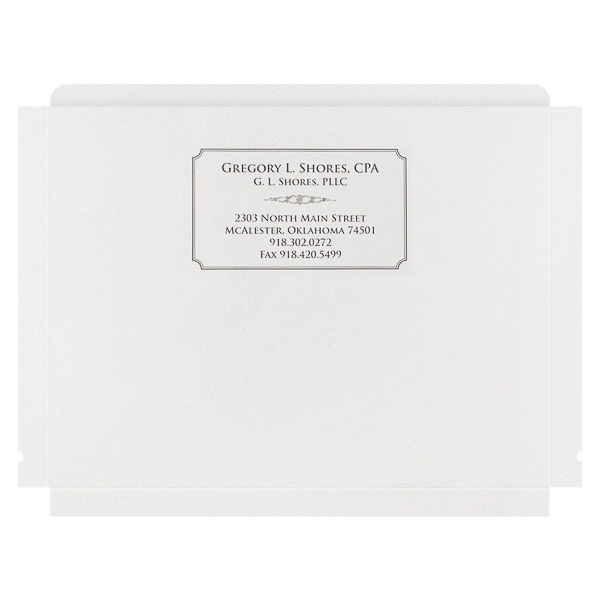 This expandable file folder lets CPA Gregory L. Shores's clients store their financial documents in one convenient place. They also can write in their own custom label for their files along the full-length tab. The Gray Fiber stock is speckled; dark flecks give it the illusion of texture while letting the surface remain silky smooth. A box around the firm's contact information completes the design, mimicking the shape of the file folder. Four-color process printed on Side 1 of 12pt C1S White Semi-Gloss stock coated with Aqueous Gloss. 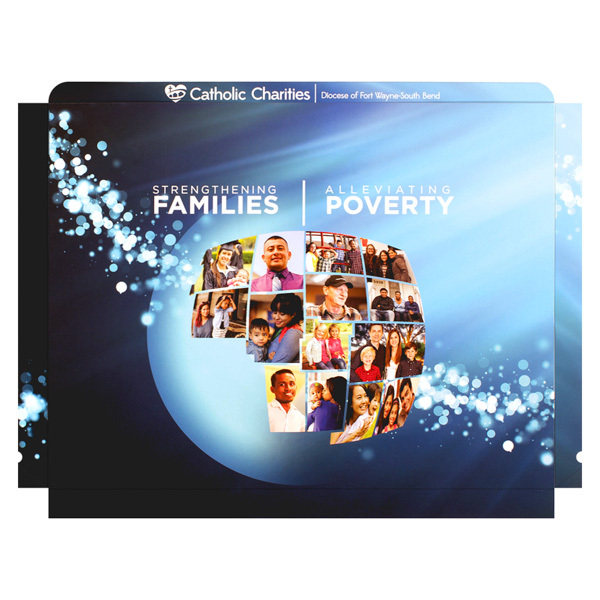 Catholic Charities illustrates its global efforts to help people with this design. Images of happy people circling a globe is on the cover. A map of Indiana locations is on the back, along with contact information. This workhorse comes outfitted with expandable features and a reinforced tab for maximum durability. An unsealed gusset allows the single pocket to carry up to 1 1/2" of print media sized 8 1/2" x 11", from slim letter-sized papers to thick presentation packets and pamphlets. The gusset's flexibility allows the product to lay evenly, whether it's brimming with papers or carrying only a handful of documents. The top filing tab runs the length of the product and is reinforced to reduce the risk of bending or tearing. Imprint the 1/2" tab with your brand's name, contact information, or even an interesting pattern to make it stand out among other items. Dimension Closed: 11 3/4" x 9 1/2"